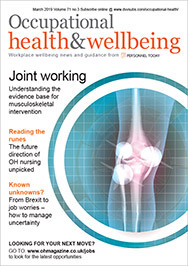 This month’s round-up of recently published occupational health research studies looks at occupational therapists experiencing musculoskeletal injuries, stress in the working environment and chronic heart disease rehabilitation. Almost a quarter of occupational therapy (OT) practitioners experienced musculoskeletal injuries over the course of a 12-month working period, according to a study of practising therapists in Texas. Muscle strain was the most frequently reported injury (cited by 52% of the sample) and the lower back was the most likely body part to be injured. Patient handling was the primary factor associated with injuries, as were lack of experience and, conversely, many years working in the profession. Alnaser MZ. “Occupational therapy practitioners with occupational musculoskeletal injuries: prevalence and risk factors”. Journal of Occupational Rehabilitation, first published online 5 June 2015. The association between employee wellbeing and the working environment has been well established, but there is less evidence for the direction of causation between the two sets of metrics. A study of physicians used longitudinal analyses to test the direction of association between established job stress models (the job demand/control and organisational justice models) and three wellbeing indicators (including sleep issues and job satisfaction). It found that the direction of association is from low justice to decreasing wellbeing, rather than the reverse, but that there is more of a reciprocal association between job control and psychological distress. Elovainio M et al. “Stressful work environment and wellbeing: what comes first?” Journal of Occupational Health Psychology, vol.20(3), July 2015, pp.289-300. Employees receiving a fit note from their GP can feel stigmatised by the process of sickness certification, according to a small-scale qualitative study of patients. Participants were asked to provide a narrative of their experience of the fitness for work process, including their feelings about their GP and their employer’s reaction to sickness absence. Several main themes emerged from the interviews, including: significant stigma; a preference for being seen by a familiar GP who understood the patient’s attitude to sickness and work; and emotional barriers. Rachman R et al. “Patients’ attitudes to sickness certification in general practice”. Occupational Medicine, first published online 14 June 2015. A major longitudinal study of Australian workers provides evidence of a link between long hours and worsening psychological health. The study is based on 90,637 observations from 18,420 people between 2001 and 2012, concluding that working more than 49 hours a week is associated with worsening mental health than working standard full-time hours (35 to 40 hours per week). The difference in mental health was greatest among women working longer hours than men, and mental health declined fastest among employees working long hours in higher skilled jobs. Milner A et al. “Working hours and mental health in Australia: evidence from an Australian population-based cohort 2001-2012”, Occupational & Environmental Medicine, first published online 22 June 2015. Growing numbers of people are returning to work with chronic heart disease, which is raising issues for OH professionals about how to manage this process and, in particular the role that the psychological working environment might play in further episodes of sickness absence among this group of workers. This study finds that, among a group of employees with heart disease returning to work, almost one in five experienced a new period of sickness absence during the first year back. However, the psychological working environment was only associated with new absence three months after the initial treatment for heart disease, but not one year subsequently. Biering K et al. “Psychosocial working environment and risk of adverse cardiac events in patients treated for coronary heart disease”, Journal of Occupational Rehabilitation, first published online 5 June 2015. An international group of experts has produced a set of recommendations for employers on how to promote the avoidance of prolonged periods of sedentary work. The guidance states that employees in desk-based jobs should initially aim to accumulate two hours of standing or light walking during a working day, moving towards four hours if possible Seating-based work should be regularly broken up with standing-based tasks, the use of sit-stand desks, or taking short active standing breaks. Employers should also promote the message that prolonged sitting, both at home and out of work, may significantly and independently increase the risk of cardiometabolic diseases and premature mortality. Buckley JP et al. “The sedentary office: a growing case for change towards better health and productivity. Expert statement commissioned by Public Health England and the Active Working Community Interest Company”. British Journal of Sports Medicine, first published online 1 June 2015.